Leaving to study abroad was one of the scariest things I have ever done. 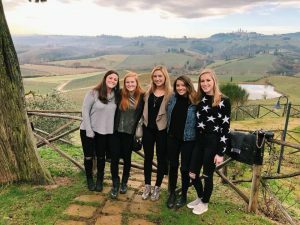 Studying abroad in a new country seemed like a dream that would never become true. Reality did not begin to set in that I was leaving until my bags were packed and I said my goodbyes. Even in the airport I still did not feel like I was leaving America for a full semester. Once the plane started taking off, I realized the time was finally here and I could not turn back. I played on a funny movie as I held back tears from leaving my loved ones and prepared myself for a new chapter in my life. After a long day of traveling, I landed in Florence around 9 am. Luckily, I had friends from school on the same flight as me which made landing in a new country not seem as scary. It is very important to not let yourself get freaked out once you land. Instead, you must embrace the fact that you took a leap of faith and you are about to embark on an experience of a lifetime. The SAI workers were extremely helpful and they gave us packets of information which I highly suggest reading thoroughly. Once they dropped us off at our apartments we were set free to explore our new city. Selfie with the Ponte Vecchio! The first day is typically the scariest day because you’re in a brand new country and surrounded by a new language and culture. 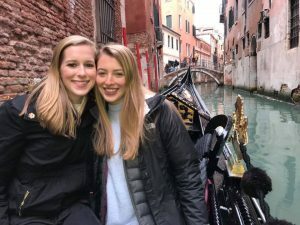 Getting lost is going to be a reoccurring event in the beginning, however, it is important to think of this as a learning experience instead of getting frustrated. I found that the GPS on my phone was my best resource for getting around the city for the first few days. Figuring out central locations around the city is crucial because it will become easier to find other locations from there. It seems scary at first, but learning to explore without directions is how you get to know your city and find different restaurants and cafes you will visit regularly. My friends and I have befriended local café owners who are extremely nice and helpful. 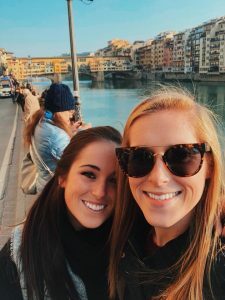 Not only does befriending locals help you attempt to speak their native language, locals are also extremely helpful with directions, restaurant suggestions, and anything you may need advice on. The best advice I can give for surviving your first week abroad is to remain calm, try to solve problems on your own before seeking help, and to explore and embrace your new city as much as possible. Studying abroad will be scary at times, you may even wonder why you went abroad when you start missing your loved ones. I am here to tell you that you will adjust and you will have the time of your life. Let yourself accept these changes in your life and learn to love your new city and lifestyle and you will have the best experience of your life. 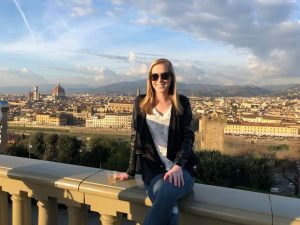 Mary Britt is a spring 2018 SAI Florence student from The University of South Carolina.